Abstract: Inventions for underwater technology can include a variety of new subsea innovations, such as methods for placing moorings, manufacturing of hydrophones, using remotely operated vehicles (ROV) in a new way, a new lighting device to illuminate underwater drilling, underwater test equipment, controls systems, quick disconnects and fancy new diving flippers. Protecting this technology in the United States, and internationally in the countries of the 134 members of the Patent Cooperation Treaty (PCT), is an expensive and sometimes seemingly endless process. Abstract: Researchers at the University of Victoria have developed a hybrid autonomous underwater vehicle (AUV) named MACO capable of three–dimensional keeping and manoeuvring without forward velocity. This makes it suitable to perform many of the tasks traditionally accomplished by remotely piloted underwater vehicles. Once operational, MACO was used in a Defence Research and Development Canada (DRDC) feasibility study for using AUVs to support rapid deployment of acoustic element arrays. The AUV was required to stop and hover, while triggering a low frequency sound source. The performance of the MACO during these sea trials is presented as the conclusion to this paper. Abstract: For the past four years detailed experiments have been carried out to investigate the propagation of electromagnetic (EM) waves between antennae in seawater in the MHz frequency range. The results have clearly shown that propagation is possible over a distance of 100m in a Liverpool Dock for frequencies in the range 1 to 5MHz using a 30W amplifier. The existing water/air/water model of propagation cannot explain this result. Therefore a theoretical model is given in this paper to explain the result and to give a generalised solution. It is based upon the generation of EM waves by dipole oscillations of the water molecules within the antenna electric field. The model has explained all the features observed in detailed experimental results obtained in tank experiments with both tap and salt water, whose conductivity varies between 0.1 and 4S/m, as well as in trials within Liverpool Dock. Within the tank the received signal in tap water increases with increasing frequency, whilst in salt water it decreases with increasing signal frequency. In general the signals in seawater are –55dB lower than in tap water. For each frequency the signal strength in seawater during propagation shows a rapid decrease in the vicinity of the transmitting antennae (near field) but only shows a slow decrease in the far field. The slow decay in the far field is attributed to a combined diffraction loss and an attenuation loss that increases with frequency. The result in the received signal exhibits a resonant effect in the frequency range 10 to 20MHz for propagation in seawater for a distance of 100m. Lower and higher MHz frequencies are difficult to propagate because the received signal strength is comparable with the background electrical noise within seawater (–135dBm) when a 30W signal is transmitted. 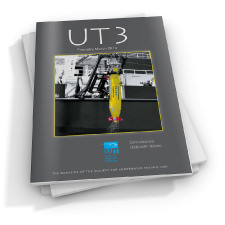 Abstract: The background and practice of insurance for autonomous underwater vehicles (AUVs) are examined. Key topics include: relationships between clients, brokers and underwriters; contract wording to provide appropriate coverage; and actions to take when an incident occurs. Factors that affect cost of insurance are discussed, including level of autonomy, team experience and operating environment. 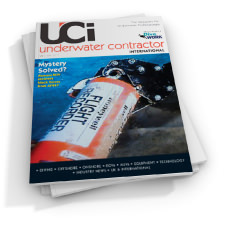 Four case studies from industry and academia illustrate how AUV insurance has worked in practice. The paper concludes by stressing the importance of effective dialogue between client, broker and underwriter to review, assess and reduce risk to the benefit of all parties. Abstract: This paper explores the sensitivity of a simple model of open flows, which has been developed to facilitate the preliminary assessment of the suitability of tidal channels for energy exploitation. Using models deliberately simplified for clarity, the sensitivity is shown to be dependent primarily upon length, depth and boundary roughness. The model results are then used to support the use of a non–dimensional number which may prove useful in future classification of the sensitivity of tidal channels. Energy extraction from a tidal stream is shown to have the potential for significantly altering the flow through the channel in question and, in doing so, imposes constraints on the design of the extraction system itself. This differs significantly from the practice of resource assessment in the wind energy industry. 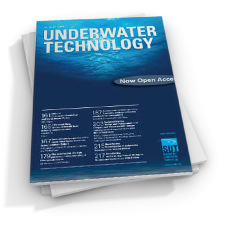 Abstract: This paper deals with segmentation and classification of textual images of seabed using wavelet domain features and modified split and merge algorithm based on fuzzy approach. The original image is first analysed using a fuzzy edge detector to improve the differentiation between different texture types. Simultaneously, two–level standard wavelet transform is applied to the original image. The high frequency detail coefficients produced from the six sub–bands of the wavelet and the image produced by the fuzzy edge detector are divided into M x M blocks. Energy of each block is calculated and a minimum distance classifier is used for each wavelet and fuzzy block to classify (and segment) the original image in a hierarchy of three levels of resolutions. The classified blocks of the two segmented images produced by the wavelet transform are merged and refined based on degree of edge certainty acquired form the fuzzy algorithm to construct the final segmented image. In this research, it is shown that energies of the wavelet coefficients are powerful features for discrimination of different seabed textures. The classification results of the energy features of the wavelet coefficients are compared with the results of other features of the wavelet coefficients to show the fidelity of this feature. The proposed approach provides a fast tool with enough accuracy that can be applied in real–time applications of automatic discrimination of the seabed. Moreover, the simulation results are compared with other well–known methods to show the effectiveness of the proposed algorithm. Abstract: There is little quantitative information by which to assess the recent importance of diving to the scientific community. This review is a bibliographic analysis of the papers published from 1995 to 2006 that have been supported by scientific diving. Diving supports scientific research through efficient and targeted sampling (including numerous new species and reports), quantitative survey, observing animal behaviour, making in situ measurements, undertaking impact studies, a variety of ecological analyses, the evaluation of new techniques, by mapping underwater areas, profiling subtidal geology and by deploying and retrieving underwater apparatus. Each section is reviewed in detail. However, by comparing the database searches against a selection of publications known to have used scientific diving in the same period, possibly only 7% (with 96% confidence limits of 0–15%) od papers were captured. It is suggested that the significance of scientific diving is vastly unrepresented by the literature and that the divers themselves should try to ensure proper acknowledgment in order to preserve and promote scientific diving as a valid and cost effective underwater research tool. Abstract: The US scientific diving regulatory, medical, training and operational framework has resulted in a remarkably low decompression sickness incidence rate. In this particular segment of the diving community, diving safety research on dive computers, ascent rates, multi–day repetitive diving, polar diving, reverse dive profiles, oxygen–enriched air and advanced scientific diving contributes to the conservative risk management approach of scientific diving. The importance of scientific diving as a valuable research tool by placing the trained scientist’s eye under water is illustrated by a number of Smithsonian Institution research projects that could otherwise not have been performed, with results published in the scientific literature. The peer–review publication process validates the viability and effectiveness of SCUBA as a research methodology. 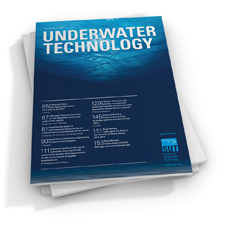 Abstract: Diving offers a research tool that permits access to well–preserved submerged sites of highly significant archaeological and cultural interest. As an example, this account presents a summary of an excavation of a dwelling and a grave at a submerged 7000–year–old Danish Stone Age site and discusses the implications of the presence of extremely well preserved Stone Age sites and entire Stone Age landscapes under water. Submerged Stone Age sites may yield a wealth of archaeological information because of the quality of preservation and the relative lack of disturbance. Diving presents an effective tool for unlocking the secrets of these sites. Abstract: Dense beds of brittlestars (Ophiothrix fragilis) were discovered in 1975 in water depths of 10–20m off Broad Beach, Kimmeridge, Dorset, within the Purbeck Marine Wildlife Reserve. Drift dives carried out during 2001–2003 aimed to map the extent of these aggregations. This paper describes the methods employed: tracking drift drives with GPS positions of the dives surface marker buoys in combination with sport diving computers recording time and depth plus ‘events’ (ie, the start and end of aggregations). The combination of GPS and dive computer enabled mapping of these aggregations in three dimensions. The brittlestars were found to be associated with the upper slopes of reef ridges but absent from the summit and troughs. Application of the techniques to biogenic worm reef (Sabellaria spinulosa) and maerl (Phymatolithon calcareum) surveys are described. Abstract: Several studies have attempted to compare subtidal animal population estimates obtained in a variety of ways using SCUBA diving and have reported a lot of variations between the estimates obtained. This study investigated individually scale–, tidal–, equipment– and observer–induced variation through analysis of animal population density indices obtained using a number of techniques based on SCUBA diver visual survey. The study was based on shallow subtidal sites on the west coast of Scotland including natural rocky slopes and recently deployed artificial reef sites. Groups of species investigated varied in levels of size, abundance, mobility and detectability. Variability in estimated densities between different sizes of sampling unit, state of tide, type of SCUBA equipment used (open circuit versus rebreather) and observation technique was found to be considerable. A decreasing asymptotic relationship with quadrant size was evident in the majority of cases for estimated density, coefficient of variation and number of samples required to attain a given precision. However, the size of the sampling unit employed had to be large enough to encompass the variability in spatial distribution of the target organism. Improved precision for estimates of cryptic species was obtained from relatively small sampling units, which focused the observer’s attention onto a specific area. Underwater photography as a population estimation technique produced data comparable with that from visual surveys but was limited by the size of the sampling unit. The use of remotely deployed infrared video demonstrated that certain animal species and life–stages actively avoid divers and were largely absent from the diver–based surveys. Although larger quadrants generated more precise estimates, the longer sampling times involved reduced their overall efficiency for most groups surveyed; optimum sampling unit sizes are suggested for particular animal groups. Abstract: Unlike military aircraft, shipwrecks do not automatically gain protected status under the 1986 Protection of Military Remains Act. Irrespective if whether or not there was any loss of life or whether the wrecking occurred during peacetime or in combat, the determination of protected status for shipwrecks, commonly referred to as designated war graves, usually depends on a judicial review process. Where there is no good historical evidence to support the case for protection, the determination of status may then be based on information obtained from present–day surveys. This technical note gives an overview of how archaeological survey methodologies can be employed in attempting to provide evidence to support, or otherwise, a claim form protected status. This account is based on the example of the SS Storaa. Abstract: The progression of hydrographic echo sounding has been driven by navigational, socioeconomic (EEZ, Law of the Sea, Offshore Oil/Gas) and research (habitat mapping, coastal erosion, etc) requirements. Since the first installation of a multibeam echo sounder (MBES) in 1963, the progression of the technology has provided a steady increase in the number of soundings, as well as increases in sampling rates, data volumes and system resolution. Recent improvements incorporate better signal–to–noise ratios, multiple frequencies, calibrated arrays and new signal processing functionality. These advancements, combined with parallel improvements in data acquisition methods and post–processing techniques, make the data more accurate, thus providing more reliable survey products. MBES technology now makes use of all aspects of the inherent acoustics to provide additional data products, such as beam intensity, pseudo–sidescan, seafloor backscatter and raw time series backscatter. The latest generation of MBES now contains the processing power to log concurrently all datagrams with the same sampling and ping rates as the International Hydrographic Organization (IHO) Special Order bathymetry data (34.5kHz and 40Hz, respectively). The result has been the incorporation of multibeam derived products for multidisciplinary hydrographic–based applications, such as nautical charting, habitat mapping, fisheries biomass surveys and sediment transport studies. This paper explores recent improvements in MBES systems in comparison with their older counterparts and discusses the effects these advancements will have on the future of multidisciplinary hydrographic–based applications in both shallow and deep waters. Abstract: Wave Hub is an innovative demonstration site for generation of wave energy located in the South West of England. In simple terms, Wave Hub consists of an offshore electrical ‘socket’ to connect arrays of wave energy converters to the national grid via undersea cables, allowing technology developers to demonstrate and monitor the operation of their devices in real sea conditions. A key element in the development of the proposed Wave Hub was to gain consent from the relevant UK regulatory bodies. This paper describes the process for the consent application followed and highlights the main issues encountered during the preparation of the environmental studies to support the application, and subsequent discussions with regulators and stakeholders. 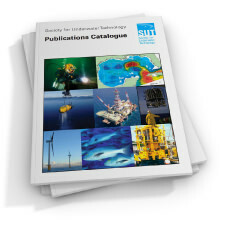 Abstract: Large–scale experiments were conducted under real sea conditions to support the investigation of non–linear mooring line effects and their importance to moored wave energy device installations. The problems associated with such testing are described, and a discussion of solutions to overcome these is given. An improvement of the experimental apparatus and procedures resulted in meaningful data that could be compared with tank testing and numerical models. The lessons learned have provided confidence in the future implementation of an offshore mooring test facility off the Cornwall coast. Abstract: A towed synthetic aperture sonar called buried object scanning sonar (BOSS) performs synthetic aperture processing and generates orthogonal projections of 3D subsurface data to view objects buried in the seabed. The development of BOSS is reviewed, including significant results. During an experiment in St Andrews Bay, Florida, the latest version of BOSS, called BOSS–160, generated images of small cylinders (simulating ordnance) buried at two shallow water sites with 3m water depths, and with sand and muddy sand bottom types. Image projections show the orientation, length and burial depth of cylinders with diameters of 5, 7.5, 10 and 15cm. Abstract: There is an ever–increasing adoption of new technologies to improve safety of life, and autonomous technology is no exception. The use of robotic machines for assisting in search and rescue (SAR) operations is evident in land and air based scenarios, and European calls for research into the use of remotely operated or autonomous systems specifically address this requirement for marine based search and rescue. This paper addresses the current state of autonomy in the search and rescue field, as well as the current technologies available for marine applications. A concept for using autonomous underwater vehicles (AUVs) in marine search roles for SAR scenarios is provided, and the feasibility of such a system is demonstrated. Existing commercially available AUVs are shown to be capable of providing a viable search area coverage rate, and sensor technology is sufficiently mature to enable detection of survivors from the proposed autonomous platform. The technical challenges for further development of the concept are also addressed. Abstract: In 2004 the Pacific Marine Environmental Laboratory (PMEL) sponsored a Request for Proposals (RFP) from industry to develop a new instrument that combined ocean current measurements, highly accurate temperature measurements and inductive communication in a single package. To support global ocean monitoring, the new instruments would be deployed on PMEL’s deep ocean surface moorings at selected depths from the near surface to 750m, with data telemetered to shore via satellite in near real time. From the proposals submitted, PMEL selected the Doppler Volume Sampler (DVS), a point current meter developed by Teledyne RD Instruments, for testing. This paper discusses the DVS engineering design, measurement capabilities, including features for data quality assessment, and the testing performed during the instrument evaluation.